This sounds like the setup for a joke like the kids' classic "Why was six afraid of seven?" Unfortunately, there's no humor in the health sciences, so we don't get a punch line where a nutritionist says, "Eh, eff G, H, I and J." But I digress. The answer, like the question, is relatively simple: Most of those missing vitamins between E and K exist, but for one reason or another—mostly scientific disorganization—are now more often called by different names. None, as far as we know, disappeared in the great Vitamin Inc. conspiracy of '99. Our first five vitamins, A, B, C, D and E, got their sequential names when they were discovered, one after the other, during the early-20th-century search for cures to then-common diseases. Many of these arose from limited intake of produce and other fresh food, which in the pre-Whole Foods era used to be much tougher to come by: Scurvy was a vitamin-C deficiency that made sailors' gums bleed; beriberi was caused by lack of vitamin B (later B1—see below), found in whole grains, meat and legumes. The general gloominess of English weather was responsible for rampant rickets, due to insufficient vitamin D.
Vitamin F: Known today as the essential fatty acids, of the omega-3 and omega-6 varieties. Should we seek these out? Possibly: They might decrease your risk of cardiovascular disease, but (warns the Mayo Clinic) they also might make you bleed and/or smell like fish. Vitamin G: The American name for what the British called B2. Eventually a truce was declared, and now we call it riboflavin. Vitamins H and I: H is one that got named under the German scheme—it stands for "haut," German for "skin," because that's what it was thought to strengthen. It's now called B7, or biotin. (Something similar happened with vitamin K, named for "koagulation.") Vitamin I was said to have a role in digestion, and has since been identified with various members of the B group. And finally, vitamin J: Beneficial to guinea pigs but unneeded by people, it didn't make the cut. The second half of the alphabet gets even messier: The bulk of the later would-be vitamins proved not to figure significantly in human growth and consequently were stripped of their status faster than a female priest. 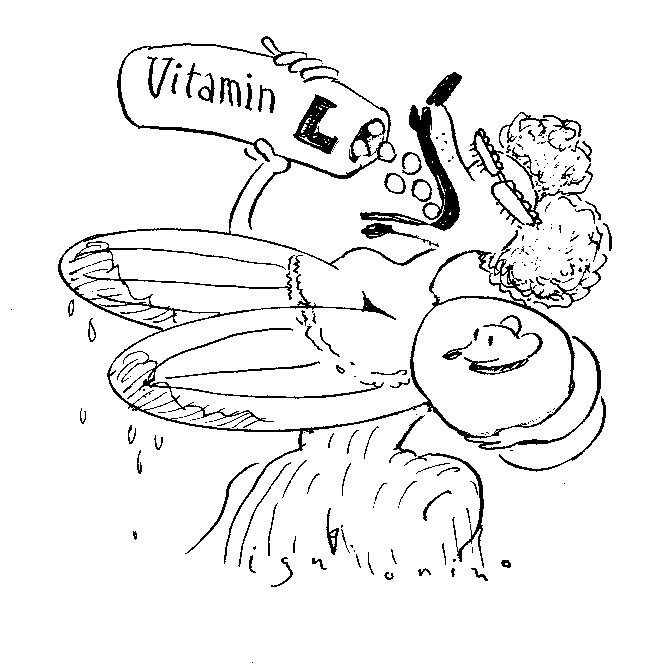 For starters, there was vitamin L, so named for its apparent role in rat lactation. Better known as anthranilic acid, L1 is now closely regulated by the DEA: As one of the primary compounds used in the synthesis of the powerful recreational sedative methaqualone, aka Quaaludes, it falls into that intriguing category of substances that are fun but potentially fatal. A period TV crime drama about its production is undoubtedly forthcoming. Vitamin M is now called folic acid or B9; vitamin P was a name given to the compounds called flavonoids, which apparently contribute more to plant pigmentation than human wellbeing; and Q is an antioxidant called coenzyme Q or Q10. Vitamin N may have been thioctic acid, and it may have helped with "burning mouth syndrome." Now we just wait till the coffee cools. Vitamin O goes all but unmentioned in the literature (meaning the name is available should Oprah pursue a career as a DJ), and the vitamin R story is nearly as murky. 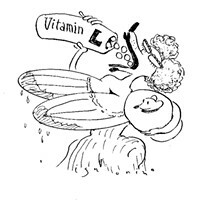 Vitamins S, T, U, V, W, X, Y and Z either turned out to be inessential to human health (S promotes growth in chicks; T heals wounds in insects) and thus failed to clear the vitamin threshold, or they never existed. The lesson in all this? Stop worrying about vitamins. Daily multivitamins in particular are a first-world solution to a third-world problem—the average American consumes plenty of the recommended daily amounts naturally without assistance in pill form. Much of the food in the developed world is injected with vitamins before it even reaches our plates. Certain vitamins, like A, can even be toxic if you get too much. A U.S. Preventative Services Task Force reviewing 27 studies covering almost a half-million people found no evidence that vitamin supplements offer a benefit for heart disease, or delay death from any cause. So really, that punch line has it right after all. Quit wasting your money on gummy vitamins and cutstraightto Sour Patch Kids. They may burn a hole in your tongue, but a little vitamin N should clear that up. Send questions to Cecil viaStraightDope.comor write him c/o Chicago Reader, 350 N. Orleans, Chicago 60654.